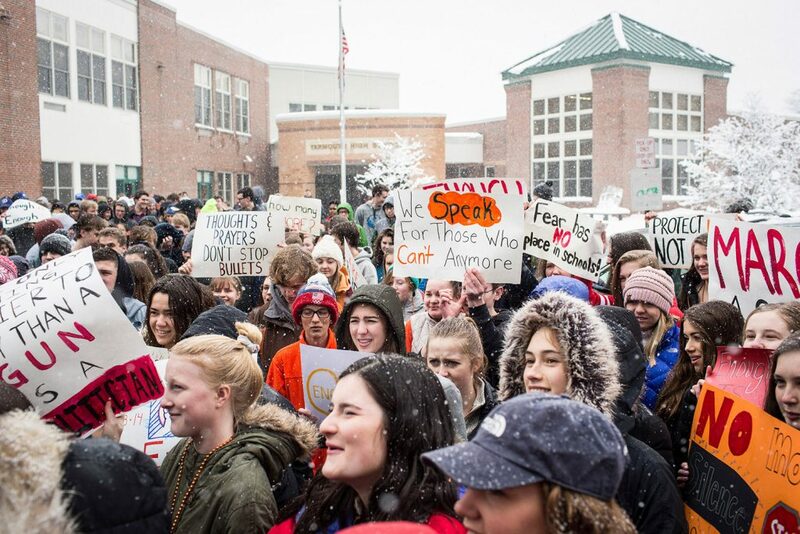 The snowstorm didn't stop hundreds of students from joining the national walkout with rallies in downtown Portland and at schools across the state. 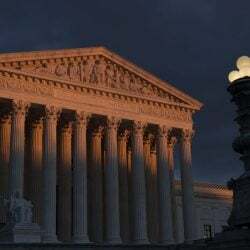 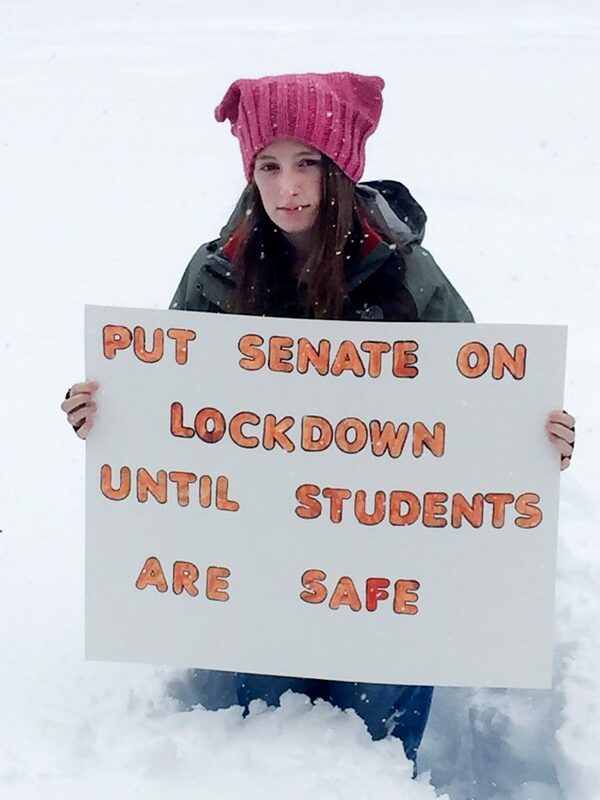 More protests are planned for today. 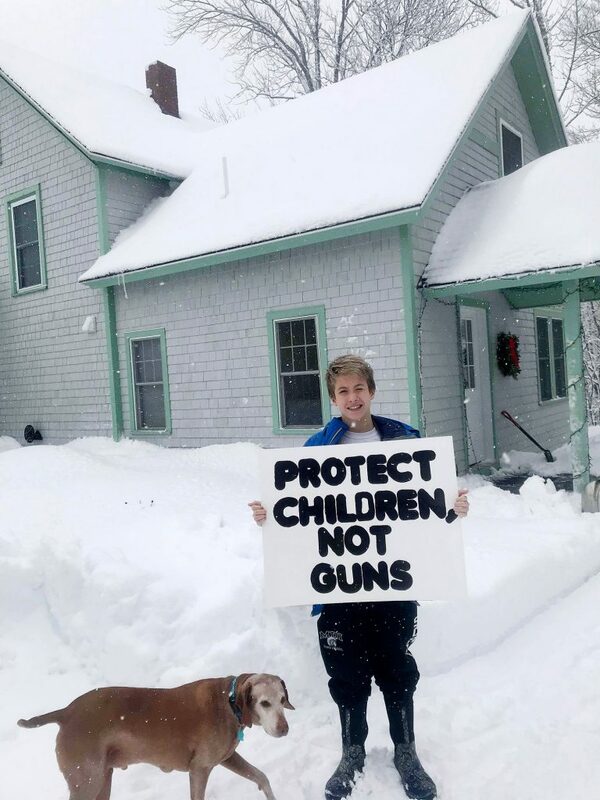 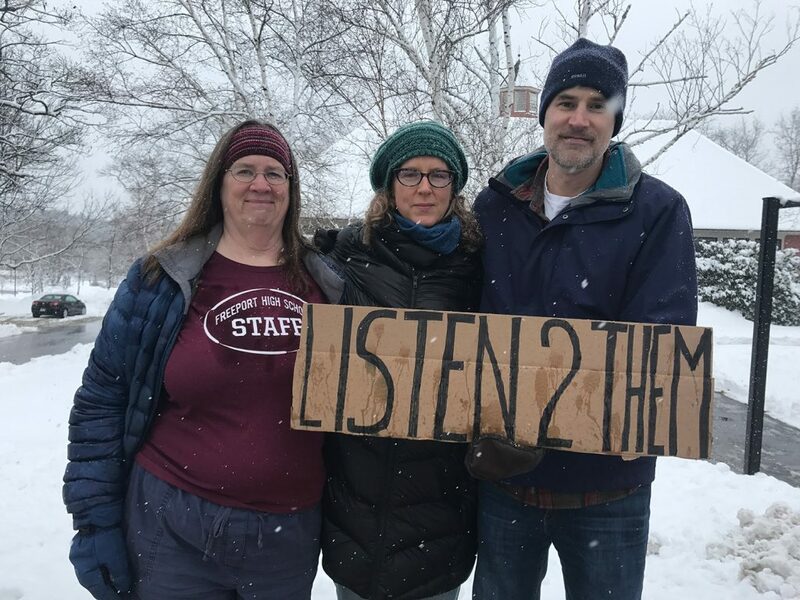 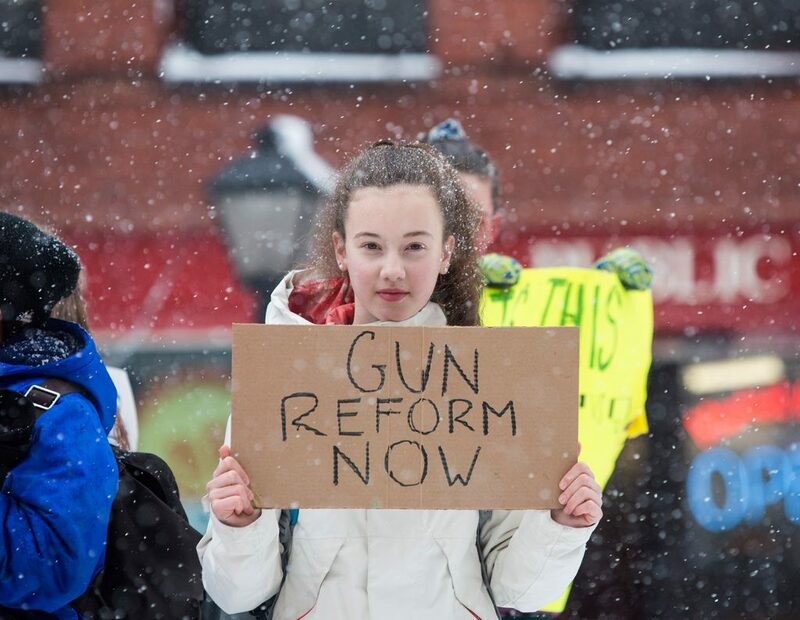 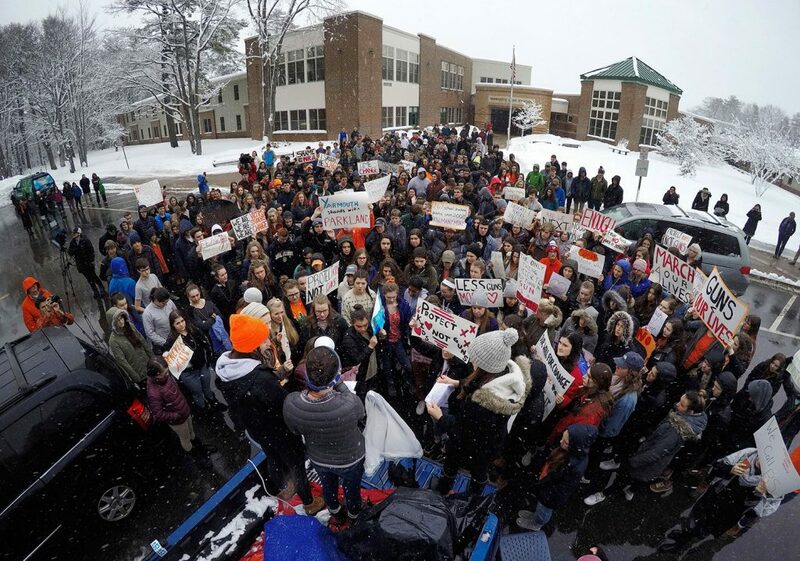 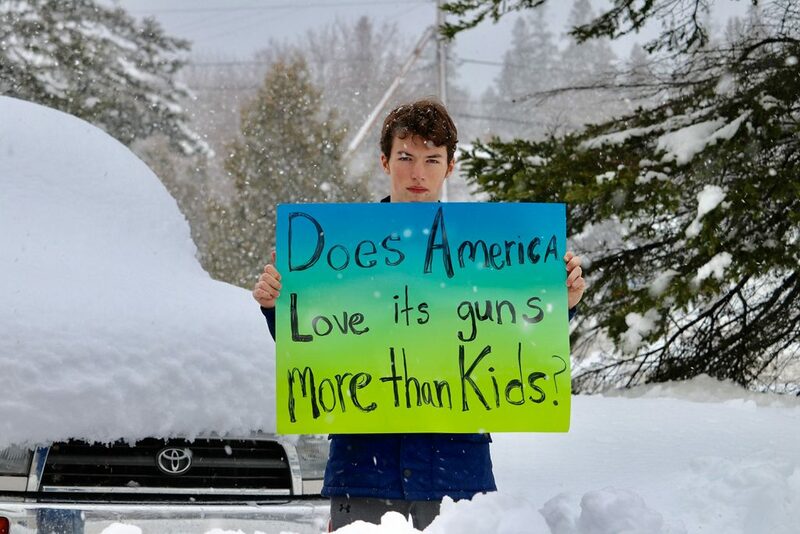 Even though the remnants of a powerful nor’easter forced most Maine schools to close on Wednesday, hundreds of Maine students held walkouts at open schools and some demonstrations continued even though it was a snow day. 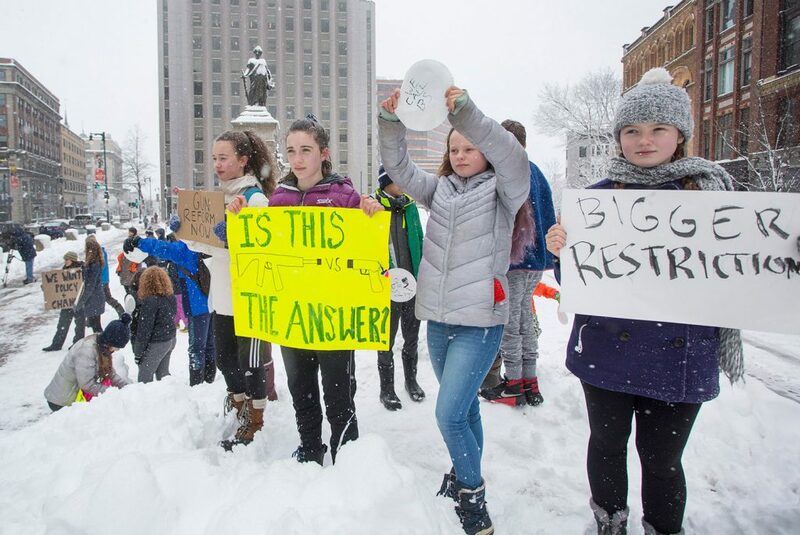 “If we do nothing, more students will die,” said Greta Holmes, one of about two dozen King Middle School students in Portland who gathered in Monument Square because their school was closed. 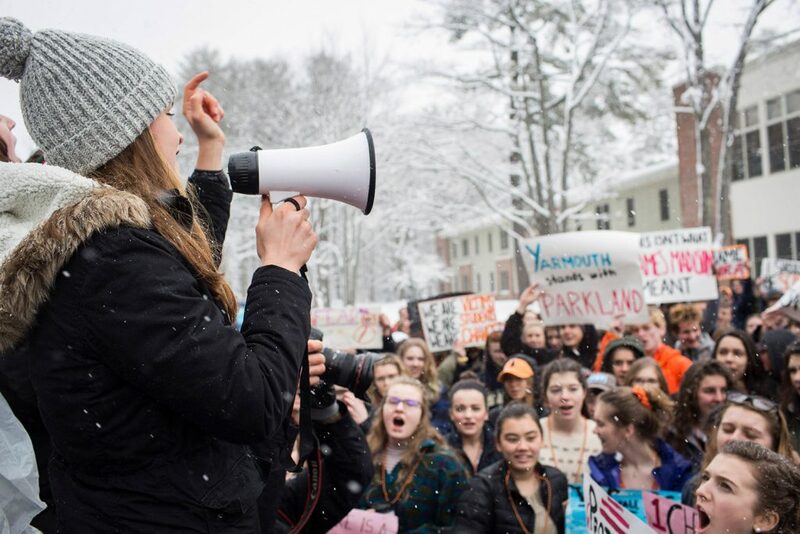 If you have photos from today’s student protests in Maine, or plan to attend Thursday’s protests, send us your photos. 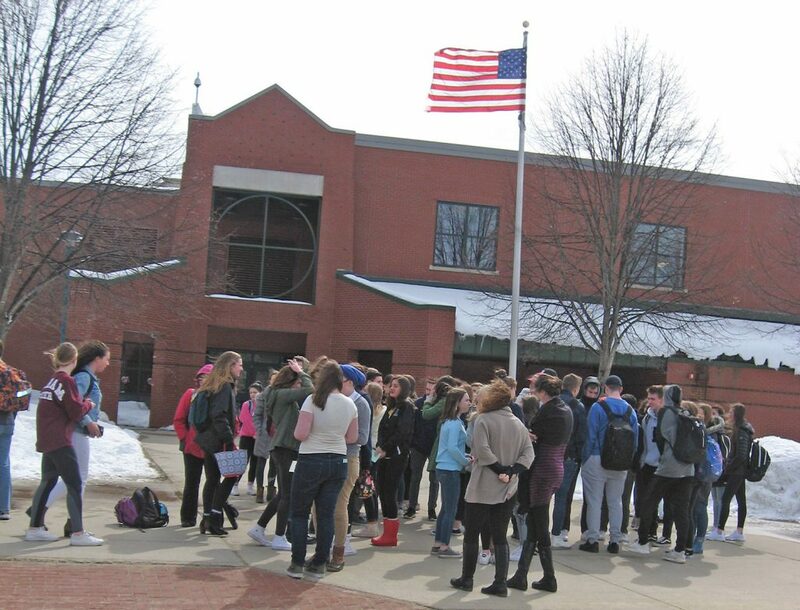 Send photos to [email protected] Please include the school and names of people in the photo. 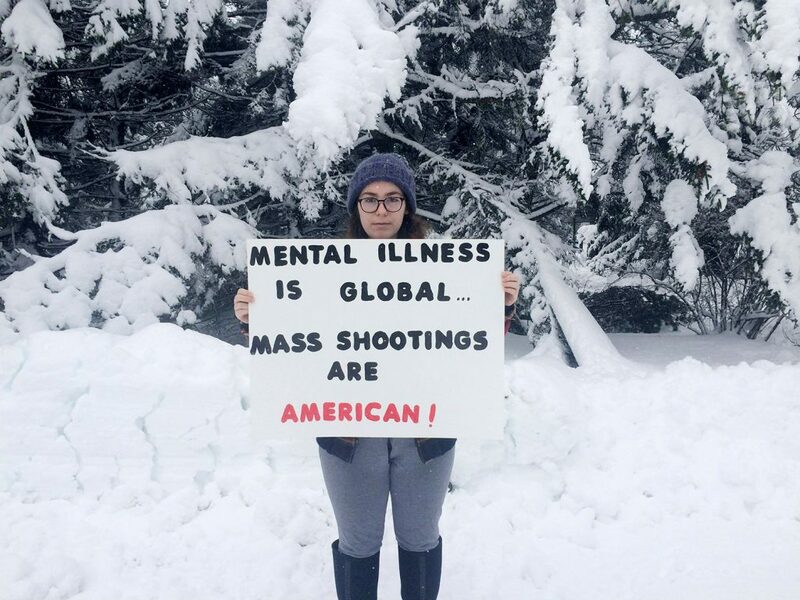 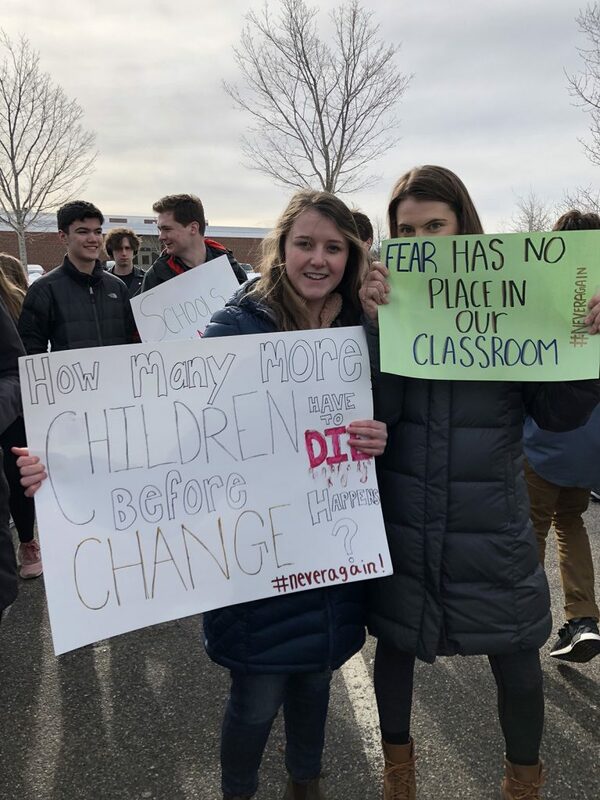 The protests – nearly 3,000 nationwide – were held one month after the Feb. 14 shooting at Marjory Stoneman Douglas High School in Parkland, Florida, which left 14 students and three staff members dead. 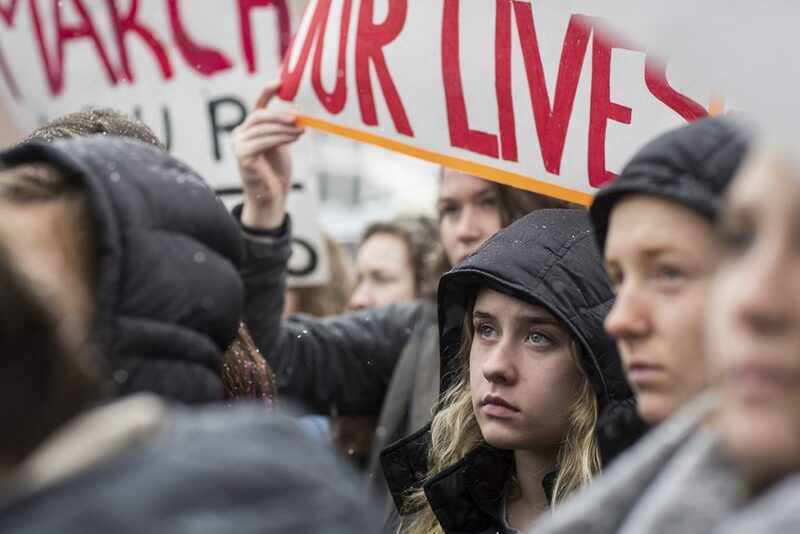 Since then, surviving students from Florida have pressed for changes to gun laws, inspiring demonstrations on school campuses around the country. 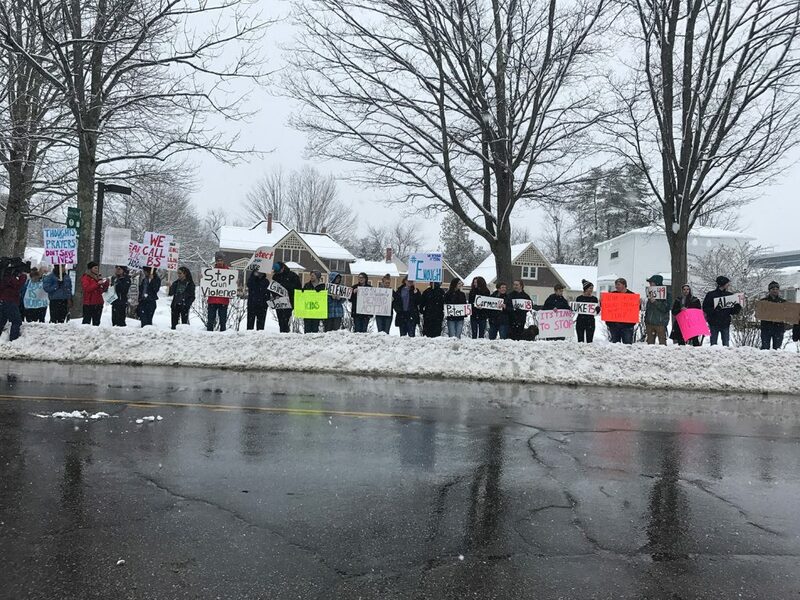 At Yarmouth and York high schools, which were open, hundreds of students staged walkouts and rallied on school grounds. 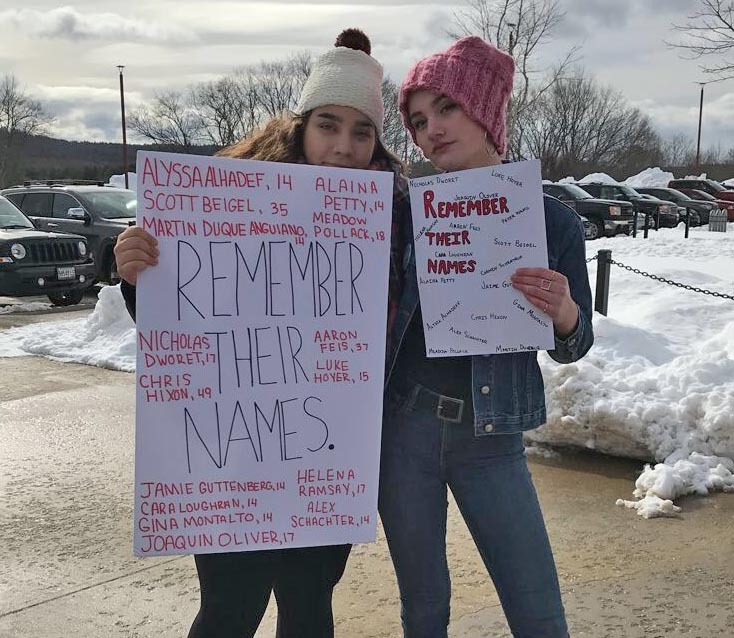 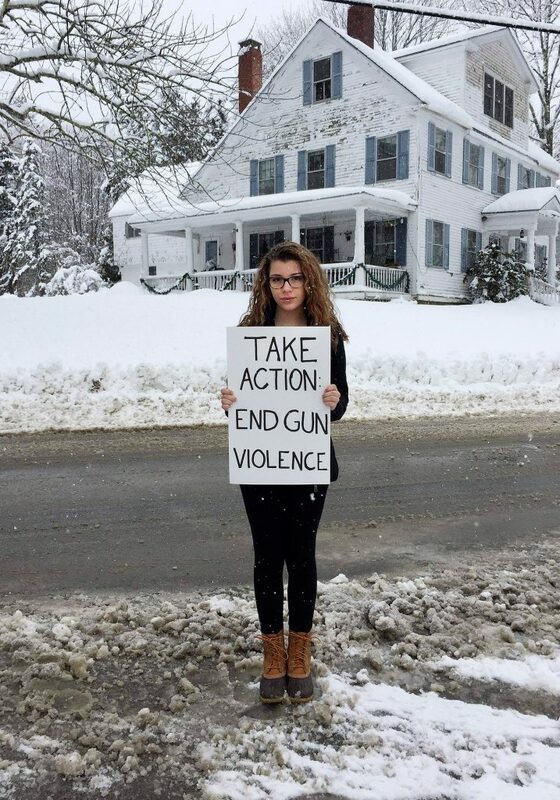 In Freeport, roughly 50 students holding signs commemorating the victims and calling for action gathered on Main Street even though schools were closed. 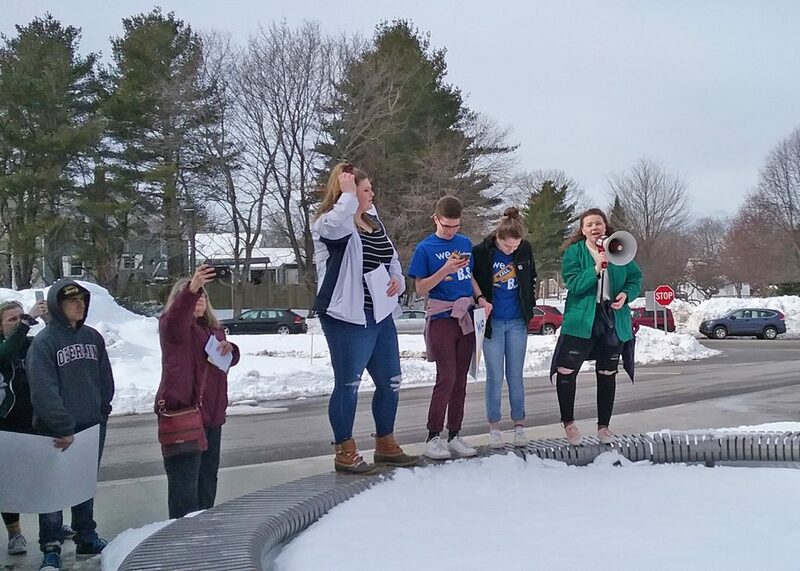 Some Maine college students also participated in the national walk out, including students at St. Joseph’s College in Standish and Colby College in Waterville. 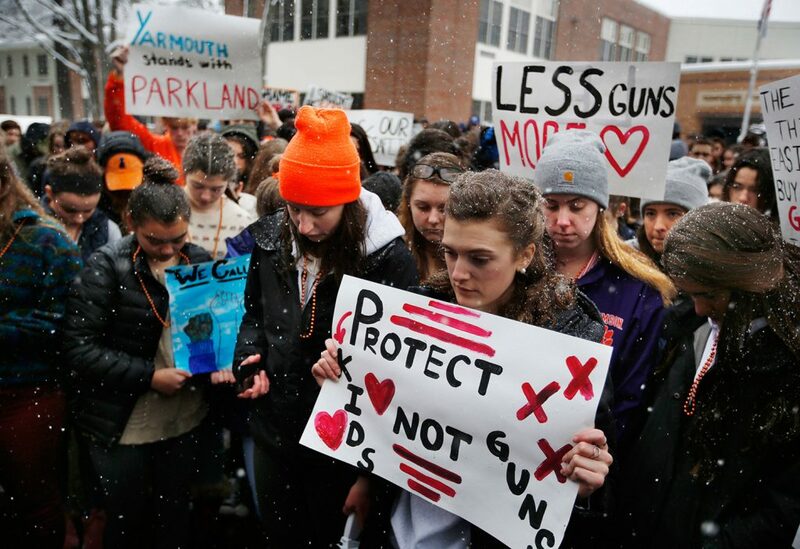 At the Yarmouth High School rally, senior Sage Watterson said every student in America “goes to school with a bundle of fear tucked into their backpack,” The Associated Press reported. 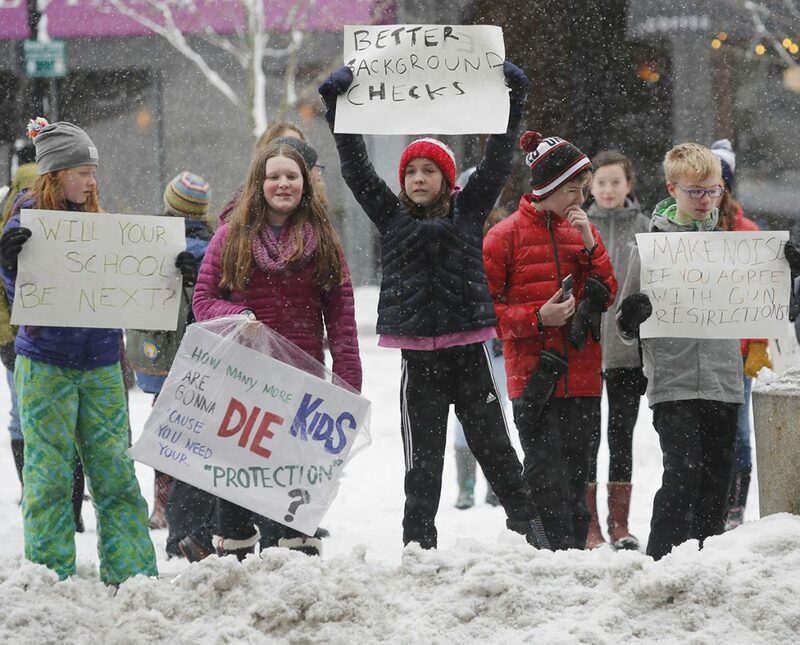 In Portland, several King students urged lawmakers to take action. 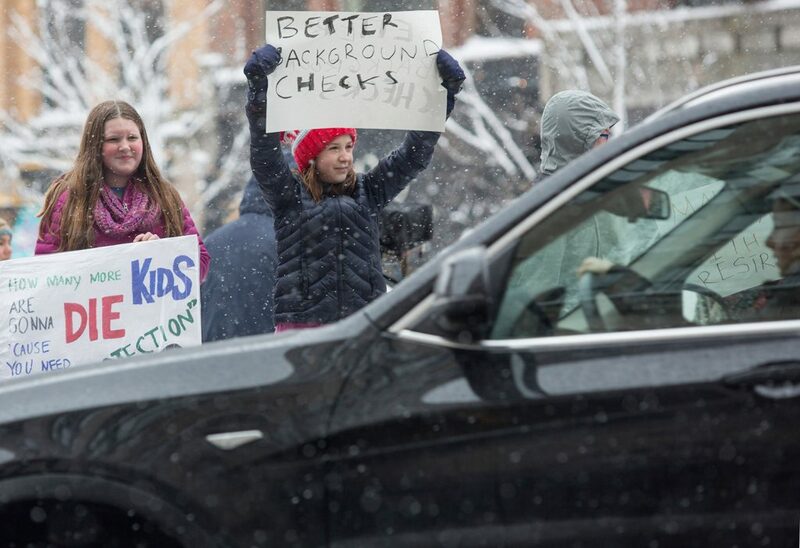 The students lined up along Congress Street, holding up signs reading “Will your school be next?” “Better background checks.” “Gun reform now” and “Is it your opinion or the NRA’s?” as motorists honked, waved or hollered their support. 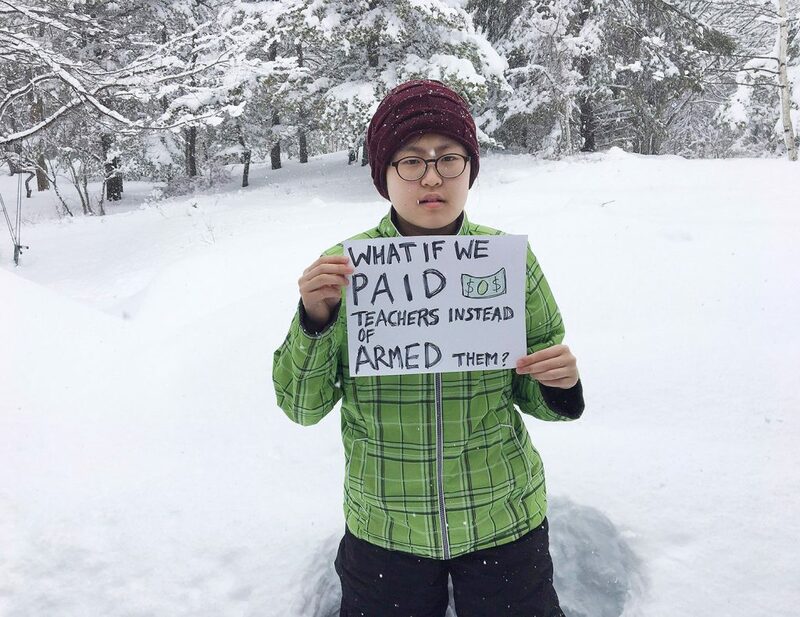 Students say they have been inspired by the surviving students’ ongoing advocacy. 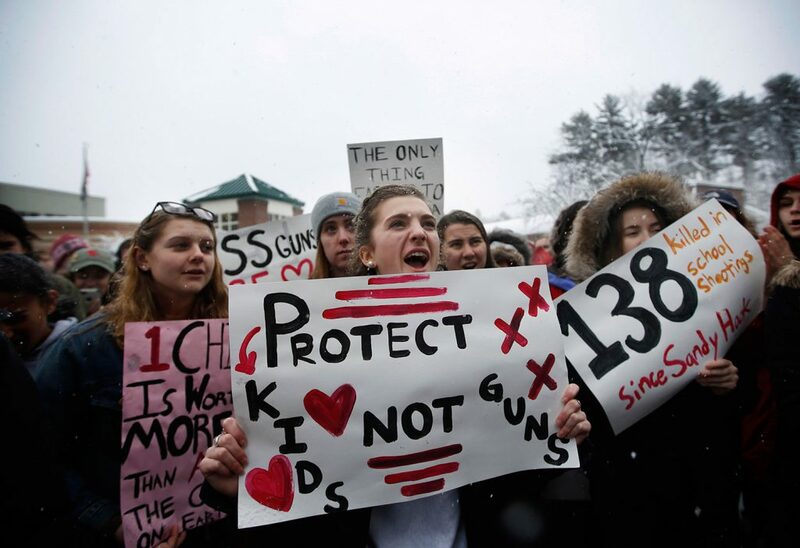 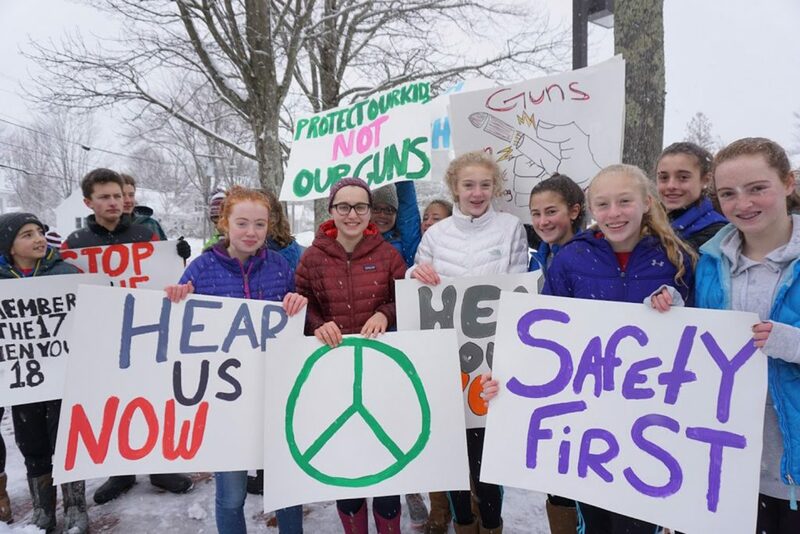 “We’re trying to honor the people who died and try to make politicians change gun laws,” said Holmes, 13, adding that she supports raising the age for firearm purchases from 18 to 21. 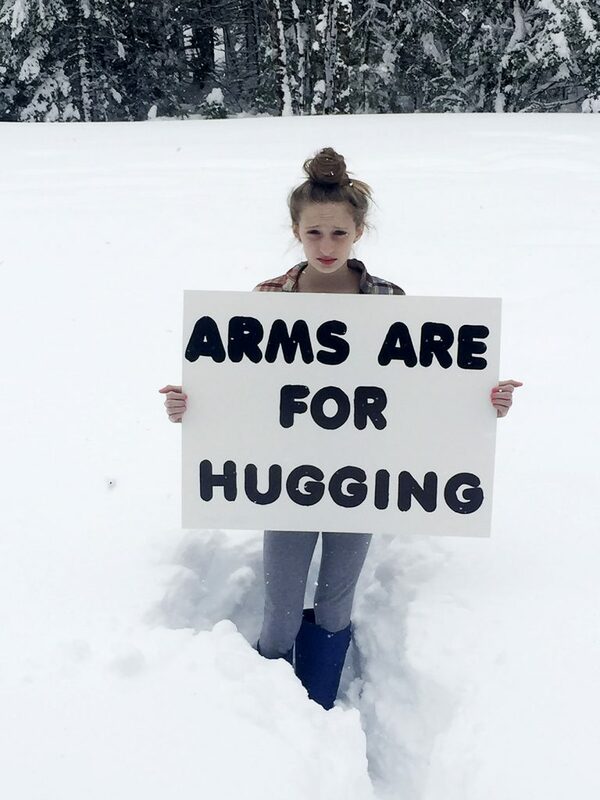 The seventh-grader was one of the organizers of the #Enough event planned at King Middle School that is now scheduled for Thursday. 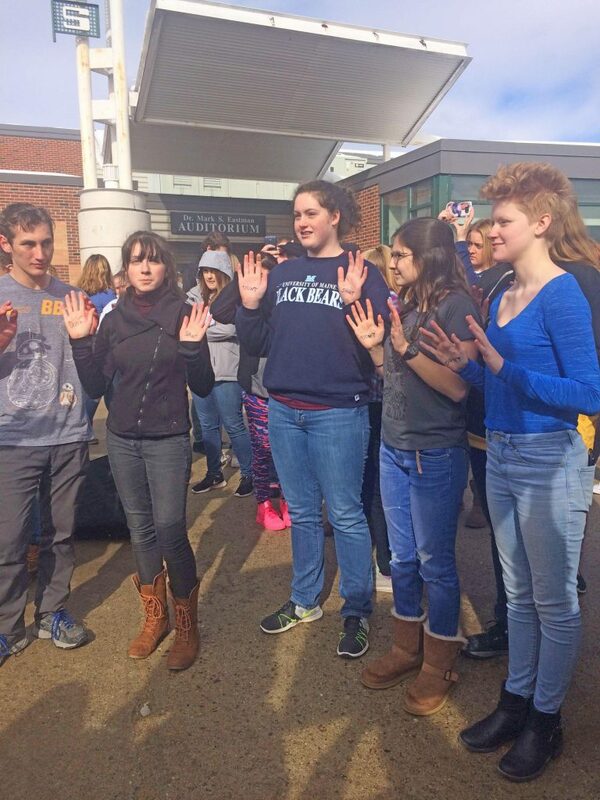 She and four other students plan to lead a walkout at the school, circle the building, then go inside for speakers and a writing exercise where students can share their different points of view, she said. 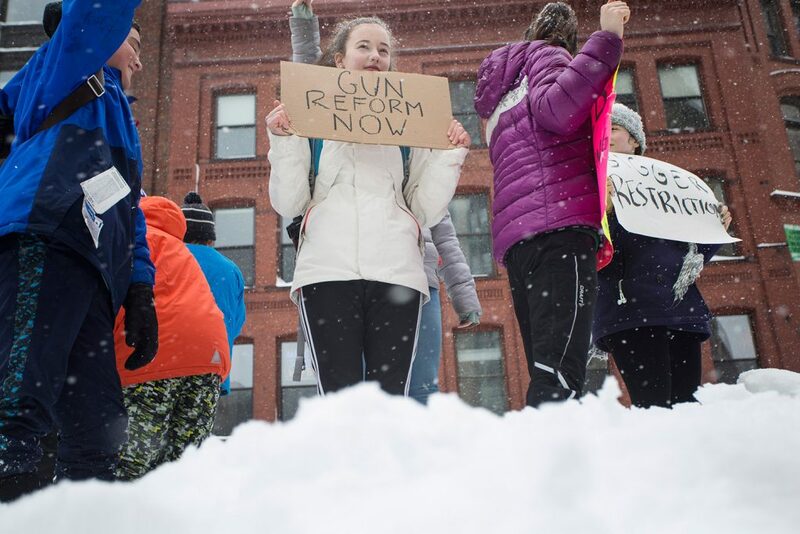 Josie Colton, a 14-year-old eighth-grader at King, was glad the students held the downtown protest Wednesday because it was more spontaneous than a school-led event. 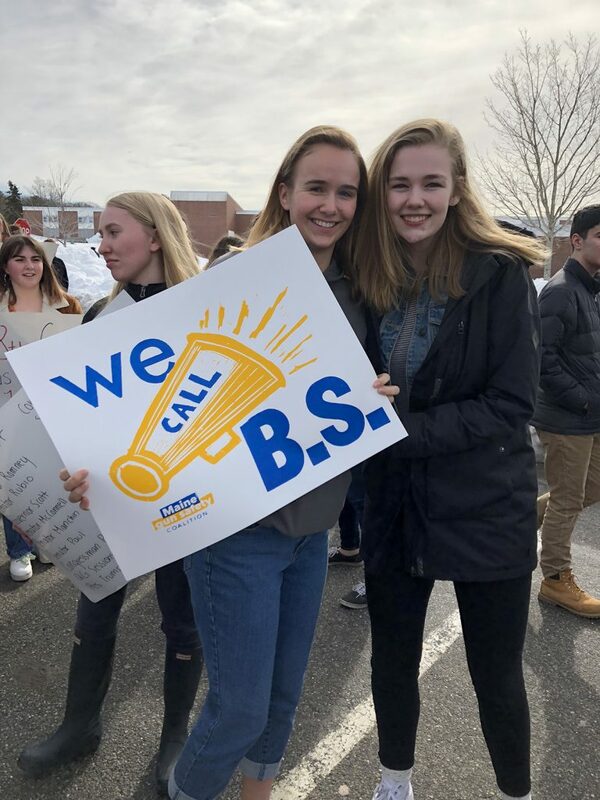 Another student, Anneke Van Mierlo, was holding up a “Will your school be next?” sign. 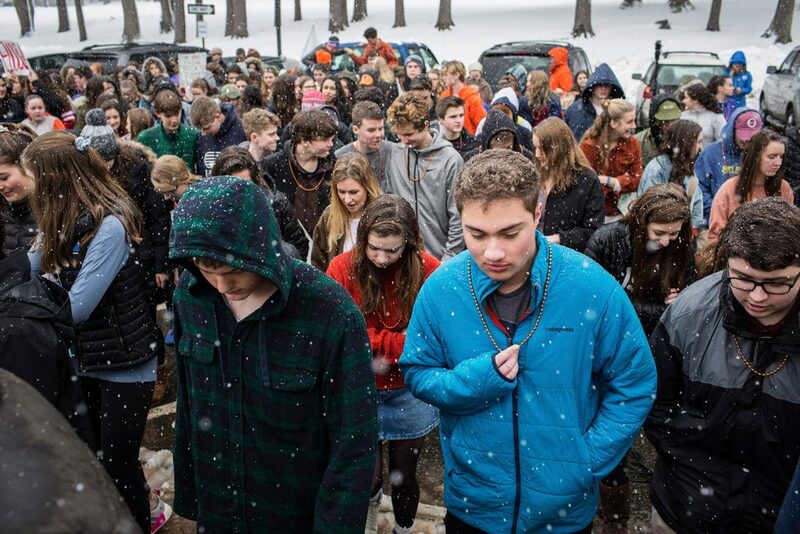 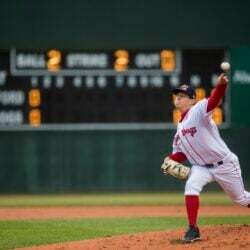 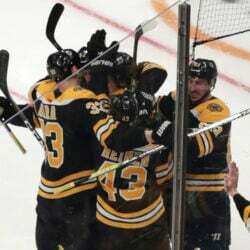 With Van Mierlo were her twin 14-year-old brothers, Matheo, a freshman at Casco Bay High School, and Mikeal, a freshman at Portland High School. 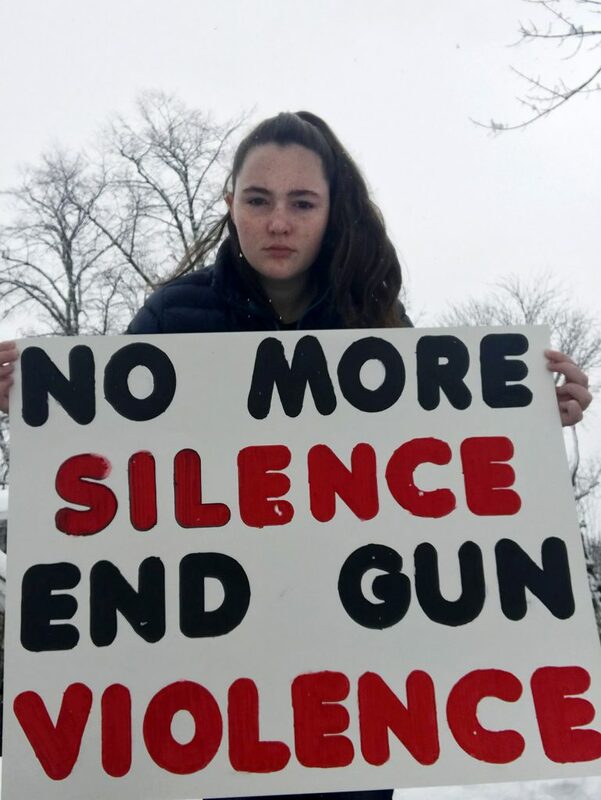 “People are starting to find out more (about gun violence) and figure out what to do,” said Matheo. 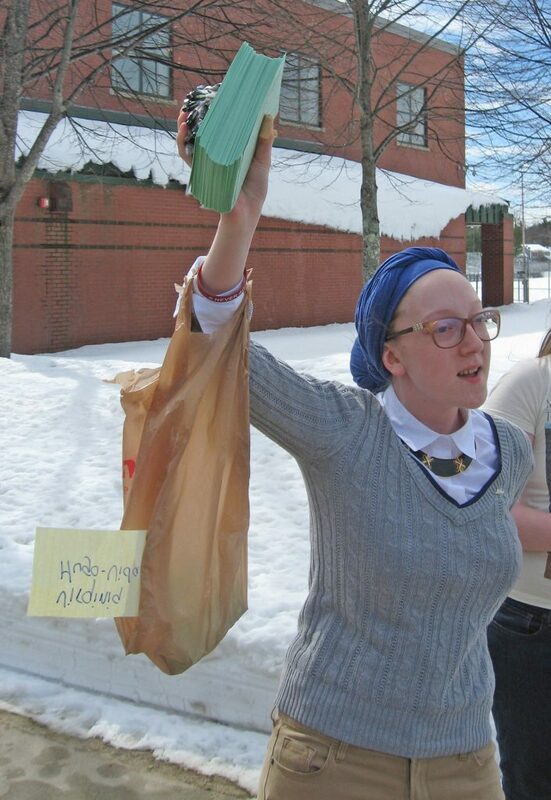 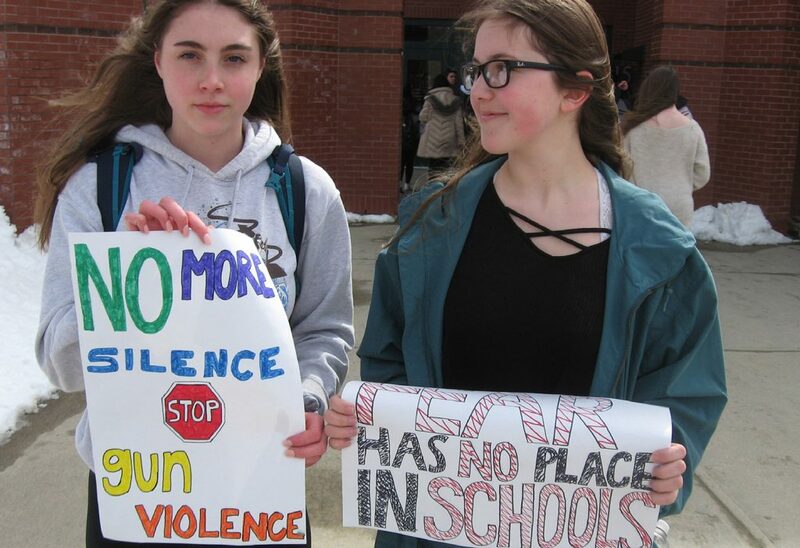 About 40 schools from Berwick to Machias planned to participate in the nationwide #Enough National School Walkout to End Gun Violence, organized by a student-led branch of the Women’s March. 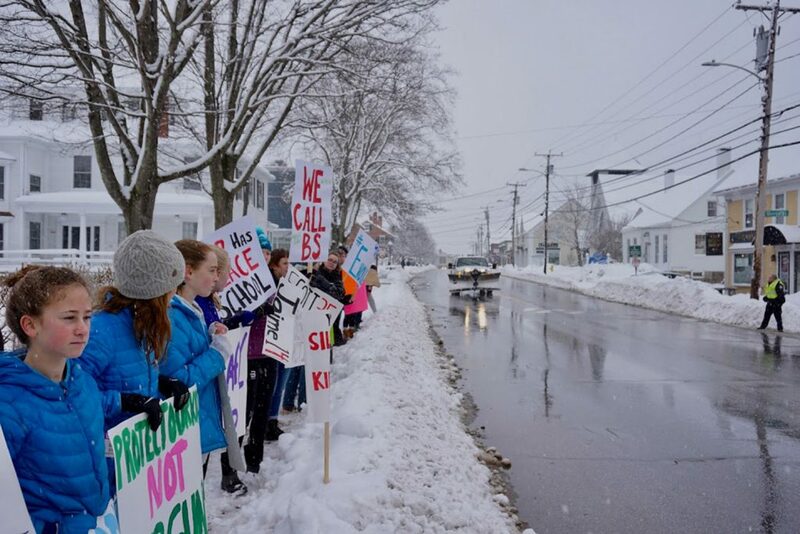 With most of the Maine schools closed Wednesday, many of the events have been rescheduled for Thursday or Friday. 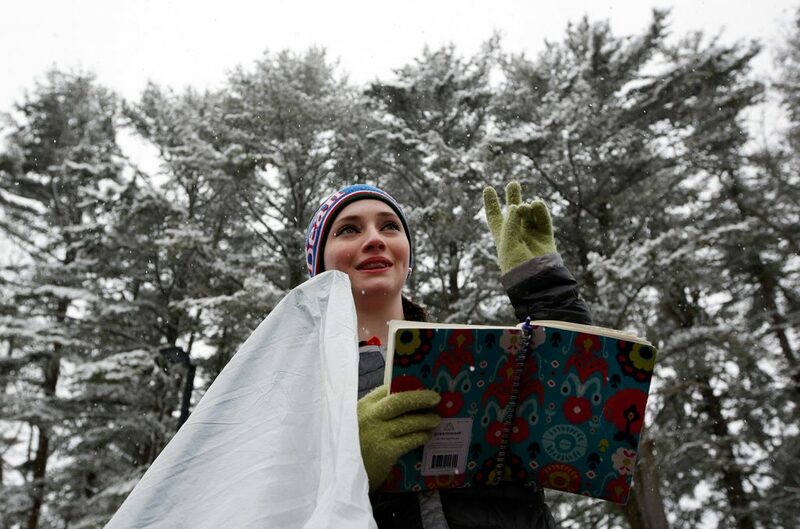 Yarmouth High School senior Eliza Brown urged her fellow students to vote. 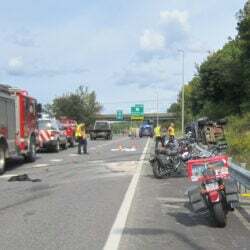 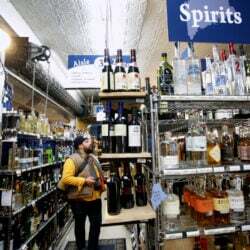 Forecaster Staff Writer Jocelyn Van Saun contributed to this report.